Airlines have offered more legroom, televisions and even martinis on flights to draw customers in a highly competitive market. In the latest unusual effort, Delta's low-fare carrier, Song, will give free tickets to passengers who are nice to one another. Song hopes the program will build customer loyalty and generate more revenue for Delta Air Lines, which has lost more than $3 billion in three years and recently warned about the possibility of bankruptcy. "We always give away products when people have a problem," Song chief executive John Selvaggio said in an interview. "I'd love to see what happens when you give away a ticket for somebody doing something good." With profits hard to come by for the major airlines since the 2001 terrorist attacks and several having to raise ticket prices recently because of high fuel costs, some have been trying a few tricks to attract customers. AMR Corp., the parent of American Airlines, said recently that it would keep its expanded legroom instead of adding more seats in many of its jets and will provide more passengers power ports to plug in their entertainment devices. In January, New York-based JetBlue Airways, which has TVs in every seatback, said it would enhance its in-flight entertainment with about 100 channels of free digital satellite radio and two pay-per-view movie channels. Song has martini bars on its flights and Atlanta-based Delta has experimented with premium food for sale and is having fashion designer Richard Tyler update employee uniforms. In the latest Song promotion, each flight attendant will get four tickets to give away to passengers at his or her discretion. The tickets will be good for travel between Sept. 7 and Nov. 10 in any of the 12 cities Song flies. Song would not say how much the initiative will cost, though it noted that the seats being given away are only a small fraction of the 1 million a month it has available and the fall period is usually a slow time in the airline industry. A marketing tour to promote the program begins Thursday in Boston. As he got off a Song flight Wednesday in Fort Lauderdale, Fla., John Murphy, a 34-year-old financial consultant from New York, said he was intrigued by the promotion. "Perhaps it will put people in a better mood on airplanes," said Murphy, who was traveling Song for the first time. Some analysts, however, are skeptical of Song's plan. 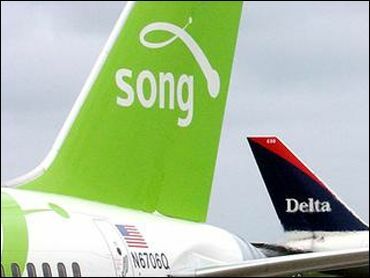 Ray Neidl, an airline analyst with Blaylock & Partners in New York, said he doesn't believe the promotion will generate much new business for Song or Delta. "Next thing you know, they'll be paying you to fly," Neidl said. "I just hope there are not that many people that are nice. Yields are bad enough already."